As a person who overcame a severe neurological disorder which left me so debilitated I could barely brush my teeth or pick up my 5 pound dog, I often marvel over the messages of illness that circulate in popular culture. After a recent visit from varicella zoster, the virus which causes the shingles and the detection of far more severe, life threatening illness in beloved members of my community, these reflections have been foremost in my mind. Two of these people were diagnosed with cancer. What I’ve been contemplating most is the metaphors and images of war applied to illness recovery and the actual roots of illness, especially cancer, in the culture and industries of war itself. Medical institutions in the United States are indistinguishable from this country’s war machinery and institutions or from big pharma and agrochemical industries. As I will demonstrate later, many multi-national corporations produce ‘integrated’ product lines that span all of these industries. So it is perhaps more ironic than surprising that the war on drugs and crime, and the overall violence, subtle or overt, veiled or seen, that defines our national landscape has morphed into a war on diverse illnesses, especially cancer. Waging all manner of wars is indisputably a highly lucrative venture, in a recent assessment by the blog SmartAsset, the US Prison System’s estimated worth is $74 billion, greater than the GDP of 133 nations. The war against dis-ease is no different. US healthcare is a $2.9 Trillion industry. According to 2014, statistics from the National Cancer Institute, the cancer treatment industry is valued at $125 billion and the organization projects this sum will reach $173 billion by 2020. Some health advocates assert that the cancer industry is so profitable, there is no incentive to find a cure, clearly, there are literally billions of reasons not to find one. On the other hand, as genetic and epigenetic research proliferates, I predict, along with many others, that personalizing gene-targeted therapies will be the next huge and plunderable horizon for the treatment of dis-ease. Invitae, a local start-up in this field, is unique in its aspiration to keep such testing and treatments affordable while demonstrating the pervasive reality of this trend. The health industry will continue to swell; so then must our will to fight. Although of course, herein lies the paradox: though the stance of battling disease is a widely accepted and encouraged response to illness, fighting is antithetical to healing. This does not mean that I would discourage anyone facing illness or staring down their mortality from rallying their will to live, but rather that if we wage war on illness itself perhaps we are misguided in our targets and profoundly mixing our metaphors. With regard to clear and undeniable connections between medical and war industries, we can look to nuclear medicine. In her 2009 book, Under the Radar: Cancer and the Cold War, Ellen Leopold examines how radiation, a human-made environmental toxin and by-product from annihilating war technologies such as the atomic bomb became a standard part of cancer treatment in the cold war era. To me, much of western medicine, with its hyper-focus on symptoms, has always seemed to function with a befuddling logic – a rationale that I generally sum up as the ‘knocking down the mountain to halt the avalanche,’ mentality. Leopold extrapolates that this mentality actually has its roots in the cold war ‘fight fire with fire’, mindset, the one upmanship mentality which drove nuclear proliferation . The case of radiation therapy in the treatment of cancer is even more painfully befuddling given that radiation clearly causes cancer. The examples of this are nearly endless, but a poignant case currently unfolding across the globe is the impacts of Fukashima. According to a recent AP story which covers a forthcoming study in the November issue of the journal Epidemiology, thyroid cancer incidence is up 20% to 50% in children residing in the Fukashima prefecture. Further, a March 2013 study published in the Open Journal of Pediatrics, reports that infants born in the western states of California, Oregon, Washington, Hawaii and Alaska between 1 and 16 weeks after the Fukashima fallout were 28% more likely to develop congenital hypothyroidism than infants born the prior year. If we consider that the proliferation of nuclear power plants were yet another innovation of war – they produce Plutonium 239 as a by-product, the type of plutonium used to power nuclear bombs – it is not hard to make the connection that nuclear medicine, now a 2.2 billion dollar industry, was an attempt to further monetize and cultivate global expertise on this war innovation. Finally, in the industrialized world, nuclear medicine accounts for the largest source of human-made radiation to which we are exposed. The war being waged against cancer could arguably be the ‘cure’ that is causing the disease. The introduction and hyper-monetization of pesticide and herbicide use in agriculture and for the prevention of insect-borne illness is also a result of war industry. The use of DDT during World War Two innovated mosquito and lice abatement which substantially reduced wartime mortality rates from malaria and typhus . DDT’s value in reducing global malarial rates is controversial as is its link with cancer causation. As of 1972, DDT was banned in the US for agricultural use, but it is still used for limited vector disease control across the planet. The EPA lists DDT as a ‘probable carcinogen’. Like many other pesticides and herbicides which are organochlorines, DDT is a proven endocrine disruptor which as a class have been widely documented to cause cancer. Extensive evidence linking DDT to cancer may be difficult to accumulate because DDT’s half life in the body is 6 to 10 years and the time frame of exposure in a person’s lifespan may be a key causal factor in cancer causality. Failure to account for these variables has limited the scope of research up until now. However, a June 2015 study published in the Journal of Clinical Endocrinology and Metabolism found that in a sample population of approximately 10,000 women and their daughters, in utero exposure to DDT increases breast cancer incidence in daughters. According to a 1975 EPA report, 600,000 tons of DDT were deployed for agricultural use in the US prior to the 1972 ban. Monsanto, the company that has (perhaps quite literally) made a killing off of RoundUp was one of the top US manufacturers of DDT in the 60’s up until the ban. Incidentally Monsanto has been making the headlines again recently. Following the World Health Organization’s March 2015 designation of glyphosate, the active ingredient in RoundUp, as a ‘probable human carcinogen,’ the California EPA has announced it will officially list the chemical as a carcinogen. Glyphosate is also the active ingredient in Dow’s Accord and Sygenta’s Touchdown. BfR, a German Consumer Health Protection Agency reports that some surfactants used in co-formulations of glyphosate are even more toxic than the active ingredient itself but extensive 3rd party testing has been prevented by agrochemical corporations because these formulations are protected as trade secrets and copyright protected information. In response to the WHO finding, countries across Europe are calling for a European Union-wide ban and starting this summer retailers have been removing RoundUp from their shelves. According to the UK paper The Guardian, Monsanto officials have responded with outrage and accused the WHO of ‘agenda-driven bias.’ To be clear, the WHO’s publicly declared purpose is to serve as “the directing and coordinating authority on international health within the United Nations’ system.” Among other objectives their agenda is “providing leadership on matters critical to health, articulating ethical and evidence-based policy options, and monitoring the health situation and assessing health trends.” The WHO’s 2014-2015 annual budget is $3.98 billion in US currency. Monsanto’s net worth was 58 billion as of 2014. Multi-national corporations such as Monsanto maintain their market profitability by systematically discrediting claims that their products cause health risks. The tobacco industry has does a remarkable job of making a science out of manufacturing doubt in the populace. Stanford scholar Dr. Robert Proctor has termed this agnotology, the cultural production of ignorance. Proctor’s meticulous research reveals the use of brilliant publicity techniques, such as Virginia Slim’s ‘You’ve come a long way, baby,’ campaign which used the momentum of the feminist and free speech movements to move their products, bribery of the US Surgeon General, and the use of industry backed research produced by staff scientists which for years successfully veiled the health risks of smoking. The use with increasing precision of agnotology has become essential to the business models of multi-national corporations. In a story published yesterday, the magazine Mother Jones (which incidentally ran a 1997 expose on big tobacco that convinced me to quit smoking), reports that Monsanto’s stock is tanking. Monsanto’s ‘outrage’ then is no surprise. At long last Monsanto’s global legitimacy, whose GMO seeds have been nicknamed the ‘seeds of suicide’ for the epidemic of farmer suicide in India they have spurred, is sufficiently embattled to be affecting its bottom line. This again begs the question, if there is a war against cancer and other dis-ease, what armies are amassed and against which foes? The case of Sygenta, the manufacturer of the herbicide Atrazine which is used on over half of the corn crops in the US and on many golf courses and Christmas Tree farms, provides further fodder for consideration of these profound questions. 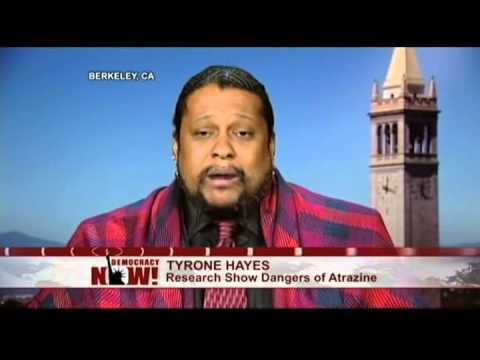 Sygenta went viral in early 2014 when a class action suit brought against the company for Atrazine contamination of water supplies revealed that the company had engaged in a 15 year smear campaign against acclaimed UC Berkeley scientist Dr. Tyrone Hayes. His research, beginning in 1997, produced evidence that demonstrated that Atrazine causes the feminization of male frogs at such high rates that frog populations could be severely impacted and that it is a clear endocrine disruptor linking it causally to breast and prostate cancer. The goal of their campaign, which is well documented by Democracy Now and the New Yorker when the court mandated that Sygenta’s internal documents be released, was to bully Hayes into silence, discredit Hayes’ research and to ultimately prevent an EPA ban on Atrazine, which is already banned in Europe. Dr.Tim Pastoor, Sygenta staff scientist, would follow Dr. Hayes at scientific conferences in attempt to publicly refute his data. In his February 21, 2014 interview with Democracy Now, Dr. Hayes retells how Pastoor would threaten him with violence stating, “He would whisper in my ear telling me how he could have me lynched,” and that he threatened sexual violence against Hayes’ wife and daughter, once stating, “Your wife’s at home alone right now. How do you know I haven’t sent somebody there to take care of her? Isn’t your daughter there?” These seem to me to be unmistakably tactics of war in which cancer was clearly not the targeted enemy, but rather an African American scientist who was simply attempting to make his potentially life-saving research available to the scientific community and the public at large. Finally, Sygenta’s tactics and product diversification as it is termed in agrochemical and big pharma industries, reveal patterns that would seem conspiratorial if they weren’t so commonplace in multi-nationals. Until 2000, when Sygenta was still called Novartis ,while producing Atrazine and battling the EPA’s efforts to ban it, the company simultaneously produced an estrogen blocking breast cancer medication called letrozole. The drug functions by blocking aromatase which is an enzyme that causes the over production of estrogen. Atrazine, as a hormone disruptor, induces the production of aromatase in the body. In November of 2000, Novartis merged with AstraZeneca and became Sygenta. AstraZeneca also produces two breast cancer medications, Arimedex and Faslodex. Arimedex blocks aromatase and Faslodex acts as a estrogen down-regulator. First as Novartis and now as Sygenta, the company excels at monetizing harm, and doubly profiting from it: the wide use of its herbicides and pesticides creates and drives demand, a ‘captive market’ of people in treatment for cancer. Currently, for women who have survived estrogen sensitive cancers, it is recommended to remain on estrogen blockers for at least 5 years and in some cases for the remainder of one’s lifespan. In popular health information, there is a pervasive hyper-individualization of illness causality, especially with cancer. If you can keep yourself out of high-risk categories through eating right and exercise, you can prevent yourself from becoming a statistic, another casualty of the war. But when you look just beneath the surface, high cancer incidence is more highly attributable to the collateral damage of the profit making machinery that drives global economies. War does get under our skin in myriad ways, though. I have a neighbor who is a former Marine and Vietnam veteran, a very kind and thoughtful man. Because of his exposure to Agent Orange there is a lattice of benign tumors throughout his body. He needs to make frequent visits to the Vet Hospital to have these tumors monitored as he has been informed by medical doctors there they can turn malignant at anytime, a prognosis that sounds remarkably, yet perhaps unsurprisingly, like a ticking time bomb. Further, the discrimination, injustices, violence and abuse we ourselves or our ancestors have faced — which at long last are receiving scientific recognition as traumatic — are increasingly being linked to disease risk, shortened lifespans, and harmful epigenetic changes. To the body, the psyche, the spirit, systematic and ongoing injustice and inequity is indistinguishable from war; the tools, tactics and weapons are simply distinct and their normalization or justification is perhaps among the most harmful of aspects. Perceived through any lens, or enacted through any means, war cannot and does not bring healing. Most importantly, there are aspects of health and healing that are obscured from view if we look upon overcoming illness as winning a war. Just the thought of war or the need to win evokes flight or fight responses that in turn provoke sympathetic activation in the body’s autonomic nervous system. This type of autonomic engagement, akin to hitting the accelerator of a car, mobilize us for defense. In these defensive states, our bodies are able to devote less metabolic resources to restoration and repair. Bodies need calm, ease and safety to best heal. Shame or blame, which frequently surfaces when a person becomes ill in our society due to the pervasive ableism of our society, also engages traumatic activation in the autonomic nervous system. This generally produces states in which people feel immobilized and resigned or unbearably anxious or sad. Sometimes people feel a combination of these emotions and this is truly overwhelming. The hyper-individualization of illness and its prevention, combined with images of war and fighting leave individuals feeling ashamed for getting ill and disproportionately responsible for their recoveries. There are over 85,000 chemicals produced in this country, this article has profiled but a few to demonstrate the high levels of toxicity that pervades the planet’s air, water and food supplies. In 2013, the UK Government found glyphosate in 30% of bread tested. That same year the NGO Friends of the Earth commissioned independent lab testing of volunteers of 18 EU countries. 70% of the people tested in Great Britain, Germany and Poland had trace amounts of glyphosate in their urine. US statistics would likely be comparable if not more concerning. This is information you will never receive in a doctor’s office. If we did, how would this alter our attitudes, practices and demands for health? I foresee a much vaster public demand for prevention, rather than cures, for neutralizing the threats to our health, rather than having to constantly fight. For me overcoming illness was a journey of over 10 years. I had already had a healthy skepticism of the health industry due to repeated incidents of abuse as a child and young adult. This included unsafe exposure to x-radiation and routine display of my body to rooms full of young residents as part of medical treatment for childhood scoliosis. I would later learn that this protocol, currently designated as medical torture by the UN, played a significant role in my later health issues. With the help of one remarkably talented physical therapist who was also highly intuitive and trained in functional medicine along and many alternative modalities, I recovered. I relied largely upon my own moxie, intellectual intrepidness (in the face of doctors refuting the credibility of my symptoms and the authority of my lived wisdom), and tenacity. Perhaps too much so; most of my healing journey was in isolation. I was frequently in too much pain to leave the house or negotiate the world. I also had to confront and transform the profound shame that inhibited me from seeking help or believing I deserved it. My shame was a consequence of growing up in a family with veiled yet incessant violence and normalized, invisibilized sexual abuse. It was also a product of deeply internalized stigma and oppression for being ill, for failing my friends and loved ones, for being lazy, for refusing to fit within easily mapped and expected gender norms, for being needy, weak, low income. A cacophony of self-judgment and blame haunted me for years. I was also frequently judged, dismissed and blamed by those closest to me, causing a near unbearable sense of alienation and despair. When one day in February 2013, I was in so much pain I could barely lift food to my mouth, I began to question if I could go on. It no longer seemed logically plausible that a body in that much pain could sustain life. And yet, I was too stubborn to give up. I realized that I must be more than my body, because if I were only my body, I’d already be gone. In the height of my pain, I was also paradoxically able to deeply appreciate the wonder and awe of life and it’s miraculous beauty. I was always an empath but I further cultivated this gift along with my intuition, something that systematic oppression denigrates and strips us of. I became what I refer to as a body detective, an excellent medical researcher often possessing more knowledge than the general internists that reviewed my case. During an emergency room visit in 2011, my doctor mistook me for a doctor and the CT scan technician told me that the questions I was asking would require a consult with a biophysicist to address. Knowledge was my power. I believe it can be for others as well. This is why I’ve continued to cultivate expertise in the field of Science and Technology Studies which I currently teach at CIIS. Most important, despite all the minimization and incredulity I have faced, my suffering has meaning and it has meaning for others. It has allowed me to assist others in transforming their suffering, helping them transmute their pain into power, and to live a life of authentic purpose as agents for change. The wisdom, spiritual strength and prowess that people cultivate through living with and/ or overcoming illness is invaluable. Not just for us ourselves, the quiet warriors, the survivors, but for our friends, loved ones, families, communities and society at large. Its value as social capital is so vast and crucial it transcends monetary value — finally something incalculable in this world of quantification and big data – let’s recognize it as such. In the coming weeks, I will have the great gift of spending time with the mother of a precious friend, chosen family, who is recovering from stage four cancer. She is not battling cancer, she is transforming her illness so it fuels her renewal, good health and long life. After years of scholarship and silence regarding my own experiences with illness, her journey has in large part inspired this piece. Her strength, grace and resilience have been astonishing. It is time for me to speak to lessen the burden for others, to help us glean the wisdom of healing to fuel change. Something that my friend’s mother recently said about her recovery moved me deeply: “this is the first time I have really gotten to rest and consider all the things there are to learn and all the things I’d like to do in my life.” Please understand that the ‘rest’ of which she is speaking involved her lying in a hospital bed with a catheter, a drain clearing the blood from her incision which zigzags with stitches from beneath her breasts to her pubic bone, and multiple IV’s and beeping flashing machines connected to her body. Supporting her during her stay in the hospital and helping to track her medications for a day exhausted me. Her determination to heal is unstoppable. For too many of us here and around the world, the rest we finally eek out for overcoming illness is the first sustained pause our lives permit. We will all sicken and die, death is a part of life. It can be a beautiful part. But have we not yet learned the lesson that the hyper-monetization of healthcare combined with enabling and abetting multi-billion industries to ravage our bodies and planet creates a hell on Earth? Humanity, at a very high cost to other life and ecosystems on the planet, has accomplished sufficient technological advances to feed, clothe and shelter everyone on the planet. If we amend our current rates of consumption, we may even still have enough water. The problem isn’t scarcity, it’s distribution. No living being on the planet should only get sustained rest or time for contemplation when facing death. I hesitate to use words with heavy religious connotation, but if anything is an abomination, this would be one, an abomination of the sacredness of life itself. The best medicine for cancer and all illness is a global universal basic income, global reparations for slavery and colonization, transitioning all societies to sustainable energy resources, making public transportation more available and usable, taking into consideration accessibility for people with diverse and differing (dis)abilities, and most importantly, more time for laughter, ease and creativity, more time for growing our own food, watching our children grow, growing old with grace. . . . . Humans, specifically the global one percent, have become near experts at monetizing harm, from my perspective a particular, but very certain type of hell. Let’s get expert on mass producing grace and delight. You may think I’m dreaming, but I’ve witnessed and experienced miracles, sometimes as prosaic as being able to tie my own shoes once again after years of inability to do so. I watched my friend’s mother walk two laps around her hospital floor, like a boss, just a few days after major surgery, wires and drains and beeping machines and all. I know it’s possible. And, once we embrace a new horizon of possibility, that each and every being on the planet deserves this kind of world, the ones we love, the ones we hate, the species we don’t even know exist, the people we will never meet, then we can do the serious work of co-creating the solutions. Want Science on your side? If you have a question regarding a health issue or medical advocacy send them to me at mordecai@bodyeclectic.net I will address them in an upcoming article or contact you personally. I am also available for individual sessions and organizational consultations and trainings. “Understanding Medical Radiation,” the Siemen’s Healthcare site, https://www.medicalradiation.com/facts-about-radiation/radiation-sources/man-made-radiation/, searched 10/9/15. Information taken from the WHO website, http://www.who.int/about/what-we-do/en/, 10/9/15. Information from WHO budget document, http://www.who.int/about/resources_planning/A66_R2_en.pdf?ua=1, 10/9/15. “Monsanto’s stock is tanking,” by Tom Philpott, Mother Jones website, http://www.motherjones.com/tom-philpott/2015/10/monsanto-stock-decline-layoffs, sourced 10/9/15.